Sour cream and chive flavoured perfectly baked pretzel knots. Perfectly baked delicious pretzel knots. Suitable for vegetarians.Pretzels Our pretzels pay homage to the birthplace of the classic American style pretzels-Pennsylvania. Perfectly baked to form wholesome crispy wheat and potato pretzel knots. 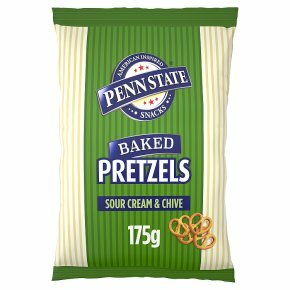 Sour Cream & Chive Flavour Perfectly seasoned with Penn State's signature Sour Cream & Chive blend. A great combination, an all-time favourite.